I met Faoud last fall. He was just a block down Vermont Avenue, across Lafayette Square on Pennsylvania Avenue — the part blocked from traffic as it passes the White House — from where I was photographing “Occupy Washington” demonstrators on McPherson Square. He was a quiet man. Diminutive. Alone. Carting a Syrian flag, jacket open on a blustery day so passersby could read the silk-screened sweatshirt that read: Free Syria. His stood there quietly — his flag furling and unfurling in the breeze — in stark contrast to the cacophony of the Occupy Washington crowd. As I talked with him, the words on his shirt took on a nuance — none of the militancy found up the street among the Occupy Washington crowd. No staccato “FREE Syria!” — more a plea than a command, a breathless “free Syria” — delivered in a long, extended exhalation of air. Faoud is a U.S. citizen. He has lived here for decades. He grew up in Syria, in Hama, and asked if I knew where that is. It is where many people have died in recent clashes with Syrian security forces under current president Bashar al Assad. It is also the site where Assad’s father, Hafez — the previous, patrilineal president — crushed opposition to his regime in 1982. Hafez’ soldiers left a large, barren field filled with rubble to mark the site —the remains of houses, shops and neighborhoods; an estimated 25,000 —as many as 50,000 — people buried beneath it. “I love this country,” said Faoud. 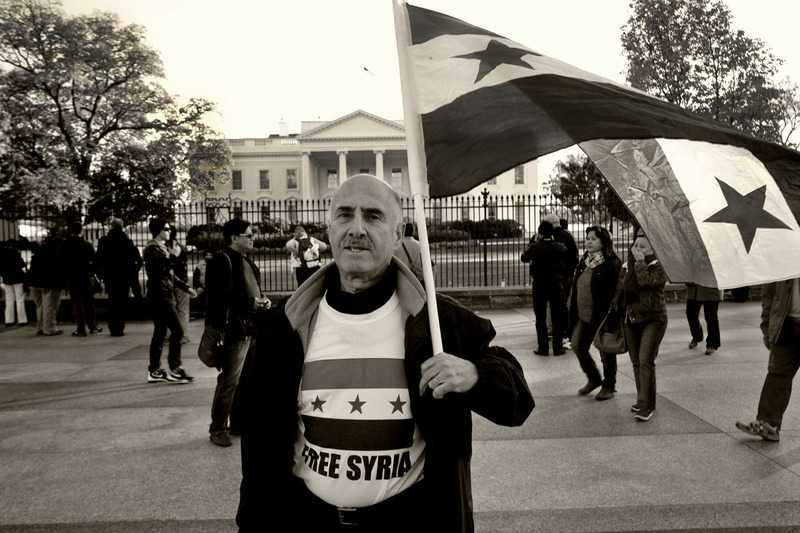 “I could never do this in Syria,” referring to his quiet demonstration, one hand sweeping in an open gesture across the sidewalk in front of the White House. What Faoud wants for the land of his birth is simple justice. … and children bundled into brothels in nations across the world … men and women trafficked across borders as workers in factories reminiscent of 19th Century sweatshops … the hungry who go without food, bent beneath political systems that divert sustenance to the haves, leaving the have-nots to starve … subtle slaveries made more insidious by their subtlety. We hear it also in the voices of our children on the playground: “That’s not fair!” they cry, until they accept the sop we offer — that we’ve accepted — that life is not fair, without questioning why isn’t it fair? Justice is a big theme in both testaments, in verses like: “… let justice roll down like waters/And righteousness like an ever-flowing stream” Amos 5:24 (NASB), and “…they themselves also will answer, ‘Lord, when did we see You hungry, or thirsty, or a stranger, or naked, or sick, or in prison, and did not take care of You?’ Then He will answer them, ‘Truly I say to you, to the extent that you did not do it to one of the least of these, you did not do it to Me’” Matt.25:44, 45 (NASB), to mention two. Simple justice — so difficult to achieve, so hard to find in our world — unless we ask: Why not? Bill Bangham is editor of CommissionStories magazine at IMB.